Improve Sales Performance – What’s Holding You Back? If you want to improve sales performance, you first need to understand that selling is a tough racket. Anyone who ever picked up a brief case, knocked on a door or made a cold call knows that much of the day is spent just overcoming obstacles. These obstacles frequently have little to do with salesmanship and more to do with complexity of the product, application of the product as a solution or understanding the prospect’s needs. CRM systems, contact management tools and marketing automation can go a long way towards helping sales reps get in front of the right contact at the right kind of company. But, when it comes to discussing your product as a solution to the prospect’s needs, they leave a lot to be desired. We are all somewhat skeptical; it’s quite normal. It keeps us from being suckered by those who have no qualms about taking advantage of others. It’s not surprising when a sales rep tells us that their product can take care of our problems, and we try and prove to them that it can’t. We do this by throwing out reasons that would seem to support that assertion. Chances are, our fund of solution-killing reasons, real and imaginary, far outnumber the pain-killing benefits and features that the sales rep can cite. This is why sales reps who move too quickly to a solution discussion usually fail. Put simply, a sales discussion must be about the prospect’s problems and not about the solution’s benefits. To accomplish that successfully, the sales rep must process two things. This is the specific knowledge peculiar to the situation or context in which the prospect operates and from which they view their world. If you are selling to doctors, you have to know something about the practice of medicine. If you are selling to truck drivers, you have to understand the world of truck driving. This is a deep-dive level of knowledge about the product and the product line in all of its permutations. You have to know how the product functions within the world of your prospect. What options make it work and if those options fix the problem at hand. In order to be successful, sales reps must assimilate all of this esoteric information into their conversational toolkit. But, with a multitude of products to sell and a wide variety of markets to address, it is nearly impossible for a sales rep to effectively do this. Fortunately, there is technology to help improve sales performance. 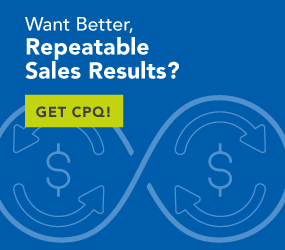 CPQ delivers a number of benefits that liberate the sales rep from having to personally remember the vast amounts of product data and domain information required for every unique situation they encounter. CPQ contains all of the information, SKU identifiers, pricing, dependency and usage rules associated with all products within your inventory. This information is organised and stored in a manner that facilitates the logical extraction of relevant data about the product during the course of a sales interview. The interview is scripted with question and answer trees that are built by domain and product experts for each product variant and domains those products are sold into. The sales rep conducts the interview in a normal conversational manner using prompts supplied by the scripting. The rep doesn’t need to “know” everything; the experts have built that knowledge into the scripting, which makes recommendations based on the customer’s answers to questions asked. Because the original quotation was based on an interview covering topics in far greater detail than a casual conversation would cover, the need to re-quote later in the buy cycle is greatly reduced. The goal of getting it right the first time is accomplished. This reduces the time to close and enhances the confidence that customer has in the solution and the rep working the sale. When re-quotes are needed, the reason can be explicitly documented based on the new inputs modifying the original configuration or price. Frequently in a complex sale, a question will come up that the rep can’t answer. The solution is to call corporate and ask the expert. Unfortunately, that expert has a job to do and that shouldn’t necessarily include participating in a sales call. In the most problematic cases, the expert is jumping on a plane and flying off to Iowa or Peru to address an issue brought up by the customer. Building the expert knowledge into the interview process reduces this requirement greatly. The answers are all there, the expert knowledge is onsite and the expert can stay home. You always have the right answer, right now! Customers ask questions, that’s part of their jobs. As deals move forward and more folks become aware of the transaction, the questions become more frequent and they may involve more diverse and obscure points. It is very important for the rep to be able to quickly answer the questions and address any issues raised by the question. Nothing will shut down the momentum of a sale like a question that no one seems to know the answer to. Knowledge-powered CPQ makes sure your rep always has the answer – the right answer, right now. If you want to improve sales performance, increase customer satisfaction and move the dial in terms of profitability within your selling organisation, CPQ will help you sell far more efficiently.